Let’s look at each phase and what it entails. The paid product, however, is not available yet. Prospects are sent to a squeeze page that asks them to subscribe and receive a series of videos, messages, or special reports or allows them to participate in tele-seminars and webinars. 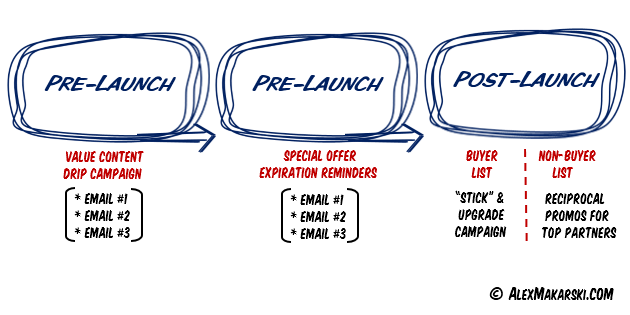 The purpose of this phase is two-fold: Build a list for the launch and create ANTICIPATION on the part of the prospects so that they are ready to pull out their credit card as soon as the product becomes available. For this phase to have proper effect on the prospects, you have to give away the best information, tips, tools, and advice you have. This may seem counter-intuitive, however, it’s critical that you do that. The day of the Launch comes and now all these people are going to rush to the website and get a copy of the product. Those prospects who don’t jump on the offer right away will receive an automated follow-up sequence of emails designed to persuade them to buy. Usually, this is the time period when affiliates make all or most of their commissions. Holding contests that are based on the number of referrals, the number of sales, the total dollar amount of sales, or a combination of the above usually helps to get your top affiliates to work even harder. This is a 1-4 week period after the launch that allows the product owner (you) to do more webinars, teleseminars, and interviews and generate more sales. Many launches skip this step and leave a lot of money on the table.